It's no secret that I love rainy weather, and nothing's better than a rainy afternoon spent at Book Cafe. Especially when I finally win a Scrabble game for the first time in my life, and score more than 200 points (211, to be exact). Game 1: dancer, an, glower, chad, coronet, ant, cages, axis, winter, die, goo, maven, hemp, goon, torn, awake, miller, proved, tearful, quit, zip, tearfully, doe, maxis, jay, sour, qi, fa, goo (yes, it made a second appearance). Game 2: scabby, boiling, horny, data, thorny, wholes, safe, silks, luau, peons, quiz, option, yen, confess, magnates, gamer, dew wend, divot, jived, latte, plod, ax, ex, turn, roil, re. Contributions from non-players are welcome. You forgot 'tearfully' from Game 1 that got megapoints. Again. Added, thanks. But now I can't remember what I played after your "quit" and before LittleMissDrinkalot's "zip". 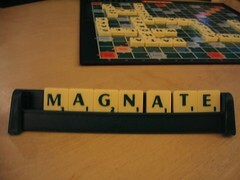 I STILL have yet to win a game of scrabble, so I can only savour your victory. Which version of the scrabble dictionary are you guys using? It seems to include hanyu pinyin and names of Malaysian mobile network operators... Hehe. m2cr > It's okay. That game was my first real victory (as in, not just pip someone by 1-2 points). As for homesickness, er ... just imagine this is some generic cafe in Perth and maybe it won't 'look' like Singapore anymore? TKL > The Scrabble dictionary we were using --- is the one in our brains :) Not sure which word is the name of the Malaysian mobile network operator, but we found "qi" listed in one of these small handbooks that are sometimes packaged with Scrabble sets, so we've used it ever since. People start chewing my chair from under me because I take too long. That's why I stopped playing Scrabble, and started playing Boggle. Of course, it's like the mentally retarded ADD cousin of Scrabble. I love Boggle! Boggle I can occasionally win at! What I totally can't do is Grabble. Ugh! BoKo is a fiend at it. I don't reorder letters and recognise word combinations fast enough.